Who knew that constructing a storage shed was such a complicated and demanding project? I certainly didn't. And I'm betting that Tina and Patrick, who spent their entire Saturday helping Chris and I construct the shed, did not understand the tortuous complexity of the project either. The day was sunny and hot! Hot being the operative word. Thankfully, we kept ourselves well hydrated and so no dehydration ailments occurred. We worked steady but not frantic. It was nice when we finally transitioned from constructing walls in the hot driveway to constructing the shed in the relative shade of the yard. As we ended construction work for the day, about 6pm, the shed was well on its way to completion, but still lacking a few critical items like doors, a window, and of course the roofing system. Isn't it amazing that I have begun to talk about a roofing system and not just slapping some shingles on the roof to keep the rain out? Amazingly, the building took shape from a relatively small pallet of materials. Everything was precut--which was both a blessing and a curse. A blessing because it simplified the construction and a curse when we could not find some of the pieces. Specifically, two smallish trim pieces which became critical components could not be found for some time and we continued on without them--until they were discovered, of all places, inside the folded door panels. But the shed is taking shape--I think I will call it the "out building" just to be different. Today, hopefully, we can finish the building and begin moving stuff into it. I also need to build a ramp for the mower to get into and out of the out building. We will paint it when we return from Florida. The kids are away this evening and Chris and i are watching all of the family's canines. That made dinner a bit problematic--and so we invited them all outside while we ate inside. After being outside all day building our shed, we needed some air conditioned comfort. There are just too many of them and some of them do not have acceptable dinner manners--they are a bit too forward in helping us eat. So--there they are--the doggies in the window. I was reminded of a song we used to sing when I was a kid, on the soon to be restored player piano at my great grandmother's house. It was How Much is that Doggie in the Window? and it was truly one of my favorite songs to sing along with on the player piano. These doggies are not for sale, but they are certainly cute in the windows on the deck. We did let them in as soon as dinner was over and they were most happy. At the end of this busy couple of weeks revolving around the traffic accident earlier in the month in northern Pennsylvania. Well, after the crisis and finding a new vehicle now comes the next part of the process. Yes--the new vehicle cannot be stored outside, it seems. And so, a storage shed in under construction in my yard--to house my tractor and the rest of the stuff from the garage that must be moved to make space. And so, in the yard there is a new floor for the new shed already complete. The rest of the shed should go up today. Another day, another project it seems. Room for the new vehicle requires another project. Let's see how it looks at the end of the day. The cat that came back, who was once lost for a week and then restored to us has developed a nasty ability. He can climb fences! Yup. No longer content to be constrained by the fence in the backyard, he can climb over the fence to freedom. That creates a bit of a problem for us--now we cannot allow him outside unsupervised. He loves wandering around inside the fence and pretending to be a big time hunter. Creativity was and is his downfall. Who knew that cats could climb fences? I remember learning about the magic of compounding when I was a kid in relation to saving money. It almost seemed that a little money could magically turn into a fortune--except it never seemed to actually do that in practice. Yesterday, I learned about the magic of compounding as it relates to errors and time. One little error can magically compound itself into a string of errors and chew up a lot of time. I noticed the first error at fitness club as I was leaving a little early after my racquetball games. I was feeling good--right up until I reached into my pocket for my keys. Not there! Panic set in. OMG, this is gonna be bad. I thought, they must be in the truck--but I never leave my keys in the truck. Upon reaching my truck and peering inside, I saw my keys on the passenger seat. It took me a while to realize how the keys came to be on the passenger seat. Digging through my foggy early morning memory, I remembered that I had decided, after parking, to charge my bluetooth earpiece and I must have laid the keys on the seat and subsequently forgotten them after I hooked the charger up. I then had locked my truck using the door lock, as I always do--and the error was made. My keys were on the wrong side of the locked door. Ugh. At least I had my cell and I called Chris to come rescue me. I figured at this point that I was going to lose at most 15 minutes--no big deal. And then compounding errors began to kick in. After 10 or so minutes, Chris called me to inform me that in her haste to come to my rescue, she had forgotten to grab the truck key. Did I just want her to go back for the key or continue to me and she and could take me home and I would drive a different vehicle for the day. I told her to bring the key--having three vehicles out and about with only two drivers did not make good sense and we had a really busy day planned with no time to recover the truck later. An additional 10 to 15 minutes was to be lost in by this first compounding error. She arrived and gave me the key--it was then that I realized that I did not have my parking pass for work--ugh, and with the time getting late there would be precious little, if any, close in open parking. And so I needed to go home to get the pass from the other car. Whereupon, I realized that I the truck was going to need additional gas if I was going to do all of this added driving--I changed to a car when I arrived home to pick up the parking pass to save some time. In the end, through the magic of error compounding, the 15 minute mistake wound up creating a series of misfortunes which ultimately cost over an hour delay. I dearly wanted a do over. I should have stayed in bed! Boring. Green and not very interesting. That is how I describe the view out of my hotel window during my recent visit to Huntsville. 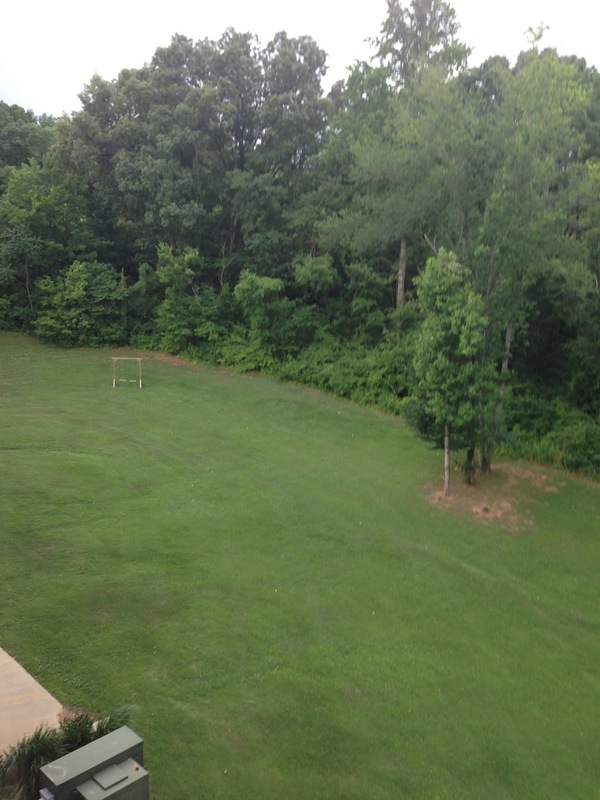 There are so many interesting things to see in Huntsville--a life size Saturn V copy of the space launch vehicle which sent Apollo 11 to the moon, mountains off in the distance, and many other things except green lawn. Did I get any of those? Yawn, I have a lawn at home. 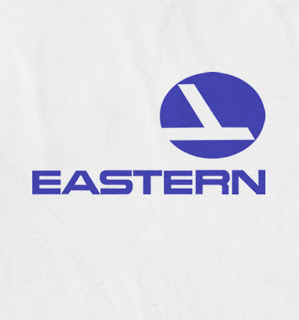 As I was flying yesterday, for some unknown reason I started trying to remember the names of all of the airlines that no longer exist-- many of whom I had the opportunity to fly on. There is even a website devoted to defunct airlines. Some of these airlines were pioneers of air travel--yet, as with so many industries they failed to innovate and remain competitive. Innovation and staying relevant. That is the key. 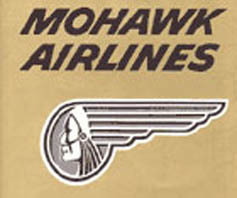 But it is good to remember old airlines of days gone by. 1. Was the moon really brighter Saturday night, or did we just think it was brighter because they told us it was? 2. Why does a new vehicle require its own space in the garage? 3. The Orioles got swept this weekend--hopefully they have it out of their systems now and can get back to playing baseball. 4. Vacation time is rapidly approaching! Yay! 5. Help me with this equation: one new vehicle plus a two vehicle garage that can't hold two vehicles equals a new storage shed to clear space in the garage. Some assembly required. It arrives Wednesday. 6. I have noticed that I have a much bigger bubble around the new vehicle while driving than I have around my other vehicles. I wonder when it will shrink down to normal? Chris and I are trying to find a way to use a two car garage to actually house two vehicles! Imagine that. With a lot of work and some really close parking we actually got her new Highlander (Cleo) into the garage with my Jag (Cat). To get this done, a new shed is being constructed to house some of the other things we store in the garage--like the tractor. But, in the end, we got both vehicles into the garage just to prove that we could do it. The shed is being delivered later this week and will be constructed next weekend. Another weekend, another project. We cruised past the summer solstice the other day and now are officially in the season of summer. I smelled it yesterday while outside. The sweet smell of fresh cut grass baking in the hot mid-day sun mixed with the damp odors of the forest next to the lawn. I was transported back to my childhood and the hills and fields of upstate New York where I grew up. I loved summer then--and I still do. I love the heat, the humidity, the smell of summer. The hot sun beating down on me. 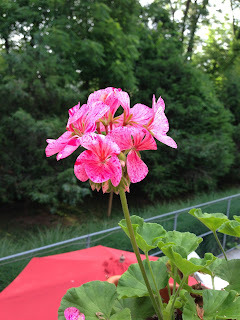 The summer flowers are in bloom and I am hearing the cicadas in the trees. In the evening hours, the fireflies are lighting up the canopy of trees that surround my house. I love their twinkling, it makes the dark night trees alive with points of light. The weather, so far this summer, has been mild. Mornings in the 60's and days topping out in the 80's. The forecast is for some 90's this coming weeks and in my usual brash way I say, "Bring it on!" Sitting on the deck, enjoying morning coffee, reading the news on the computer--what could be better? Oh yeah--sitting on the beach with toes in the water after just completing an early morning snorkeling expedition. The process that began two weeks ago on a rain drenched highway in Northern Pennsylvania is complete. 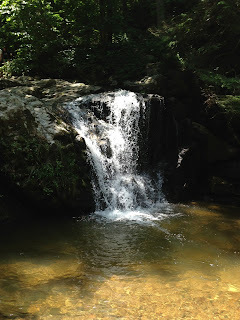 From the roadside where our Lexus was loaded onto a tow truck and taken away, now we know that we will never see it again, through the continuation of our trip for Mom's birthday and back to Maryland where the rest of the story has played out. Fortunately, no serious injuries were sustained during the accident and the major loss was only property. Unfortunately, our property. But through it all, the twists and turns and delays of the insurance companies and through the adjusting process--Chris and I have persevered. I was pleased that the other company called me this past mid-week to accept liability for the accident on behalf of their client. And then they promptly reminded me that he does not carry enough insurance to cover our losses. My insurance company--though not a smooth process by any means, has performed well. I give them a solid C plus. I was a little miffed that it took eleven days for them to render a decision to call my vehicle a total loss and then told me I had seven days left on my rental car to replace my vehicle. There is something wrong there. But at the end of it and through the incredibly hard work and research that Chris put into replacing our vehicle--we have a new vehicle in the stable. Joining Kitty, and Cat, and "the truck" is Cleo. I don't know why we name our vehicles, but then I don't know why the Navy names it ships and submarines either. Cleo is a Toyota Highlander--which has many similarities to our now totaled Lexus. It drives similarly, but did not have the "luxury" vehicle price tag. Cleo is also postured better for our current lifestyle in terms of people hauling and versatility. I was especially impressed by the people at Koon's Annapolis Toyota. They worked hard to make the sale and we enjoyed working with each of them. So thanks to you guys for the great work. I have to admit, when we pulled onto the lot for the first time and the vehicle was sitting in front of the show room ready to be equipped with tags and full of gas--I was impressed. JD gave us a superior overview of the vehicle and its features--trust me, even though I have driven a lot of different vehicles, I like getting a personal tour AND he helped Chris get her phone integrated into the car. All BEFORE we did the obligatory paperwork. The two week foray into accidents and vehicle replacements is over. I can relax on a floatie in the pool and listen to the Orioles game. They lost, again. But wow, from the accident scene through the insurance companies and finally to the replacement vehicle purchase--we have met a lot of really great people. That is one of the blessings that has grown out of this experience. Vehicle shopping is a lot like watching a stream tumble over rocks on its long journey to the sea. There are twists, turns, and options at every point along the way. Think about the complexity of it all. From a standing start, with no intention of purchasing a vehicle to being in crisis mode and needing to purchase a replacement vehicle. OK, so we focused in pretty quickly on replacing our SUV with an SUV and probably not the luxury version. Although, there is the desire to get a slightly bigger vehicle. That one is still in the air but it seems to be centering in on Toyota or Honda, but Jeep still has a dog in the mix. Then it comes down to models. Ugh!! There are so many, Grand Cherokee, Highlander, Pathfinder, Pilot, MDX. Currently the focus is in the Highlander with the Pilot close behind. Once this is decided, then it is down to trim and options. There are about ten separate trim options (counting the 2WD vs AWD differences) for the Highlander. And that doesn't include Hybrid options which adds two more. Once the trim option is decided, color (exterior and interior) and other lesser options are decided. One of the biggest discussions we had was over the need for an entertainment system with DVD/Blueray capability. We decided no, we hardly used the one in our previous vehicle. Once all of these choices and options are narrowed down, then you would think that the hardest part of the decision process had been completed. But, no. The hard part is just beginning. The grand daddy of all of the choices--which some people start with, but in reality is the culmination of all of the other decisions: New or Used (OK, call it pre-owned, ugh!)? That is an incredibly interesting decision. One with which we continue to wrestle. The really hard part of this entire process is that usually, we spend months shopping, looking and deciding. Now, however, it seems like we need to get a vehicle much sooner. I feel this puts us at a distinct disadvantage and has caused us to change some important plans. But the decision tree will be completed and another vehicle will soon be stabled in my driveway. Although I am told that I may have to make room in my garage for it. That should be interesting. One of the most important traits of effective leaders is the ability to make decisions. Good leaders are inherently effective decision makers and risk takers. Some people hate making decisions, and so they often make decisions by not making them or said another way, they are default decision makers. One of the keys to making decisions is to realize that the decision maker rarely has perfect knowledge and therefore must make assumptions to fill in the unknowns. A good decision is one made based upon the best information available at the time. Late information is of no use in making a timely decision. Fretting over making a bad decision is not useful--usually, making a decision is the most important part of the process. Being decisive includes the ability to anticipate the probability of future events and incorporate potential outcomes into the decision making process. Hindsight may provide the opportunity to second-guess, but hindsight has the advantage that making decisions in realtime does not have: historical knowledge. In my experience, perfect knowledge is too late in the decision making process to be useful. Decision making is, therefore, an art. It is the art of understanding when enough information exists, allowing for timeliness requirement,s to ensure the decision is effective. For instance, making a decision to buy flood insurance after the storm has arrived and the flood waters are rising is probably not going to have the desired outcome. The decision needed to be made earlier based upon the elevation of the property, the proximity of water, and the probability of flooding based upon the 100 year flood plain. Decision making improves with practice. The more decisions that are made, the more effective decision maker a person becomes. Some people make many important decisions per day. Others make few decisions per week. The big decision makers have a methodology to make decisions and realize that almost any decision can be second guessed later--but at the time the decision was made, only certain facts were known. 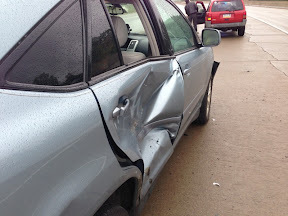 I am currently working through opportunities related to my recent auto accident. Fortunately, no one was seriously injured and so the primary decision involves how to replace the vehicle which was declared a total loss. This decision involves whether to just replace the vehicle with a used vehicle within the value of the loss, buy a nicer used vehicle for some additional money, or to take the opportunity to purchase a new vehicle. The final decision will be a combination of fiscal resources and opportunities! The key though, it not to panic. Take a deep breath and enjoy the decision making ride. I thought it was time to follow up on the continuing saga of how the traffic accident and recent developments. Although it has taken eleven days for the insurance adjusters to decide that my vehicle is a "total loss." I was also informed yesterday that they will only continue to pay for my rental vehicle for another seven days. That nearly put me off the deep end. I am expected to find and purchase a replacement vehicle, from a standing start, in seven days or less. Thanks so much. It is like I always know what is out there and an ready to walk into a dealer and buy a vehicle--without thinking. Thank you for your consideration. I guess it takes time to find the right vehicle--even more so when the purchase was unplanned. And the victims continue to be victimized. I am going to have to take time off from work to get this done. It is not easy and we have some specific requirements for the replacement vehicle. We have also canceled our weekend plans to attend our High School Reunion--for which we have already purchased (at no small expense) tickets, in order to locate and purchase a vehicle. I continue to be insulted by the incredibly low valuation placed upon my vehicle. When it is all said and done, I will likely spend many extra thousands replacing my vehicle with a different one. I have been out car shopping two nights in a row. We just missed the vehicle of Chris's dreams last evening. It was sad, we saw it driving off for servicing just as we pulled onto the lot. We had known it was there from the internet and the salesman confirmed that it had just been sold! Chris was crushed--but I reminded her that the Flea Market rule applies! What it the Flea Market Rule? The Flea Market Rule was developed during a time in our lives when Chris and I used to frequent a lot of flea markets. Upon arriving at the market, we would walk around the market first to see what was available. Often we were tempted to make a purchase at one of the first tables--but we knew that prices or selection might be better somewhere else in the market. We forced ourselves not to buy and to complete the tour of the entire market before making a purchase. The rule is: If it is meant for us to have it, it will be there when we get back. That rule works in so many places in our lives. We do not need to make a snap purchase decision without surveying the landscape or the availability, first. Although it did hurt last evening to the the vehicle of Chris' dreams driving off the lot as we were arriving. There are others out there, this was was not meant to be ours! Superman is back! The imagination and excitement that accompanies the fictitious super hero is palpable. Why? Because Superman is probably the first and purest super hero on the stage which has now become crowded with heroes. The tale of the first and perhaps best super hero is epic. Man of Steel is a reboot for the Superman enterprise and it accomplishes the task with flair and director Zach Snyder has taken the timeless story and provided some new twists for those of us who grew up as Superman junkies. 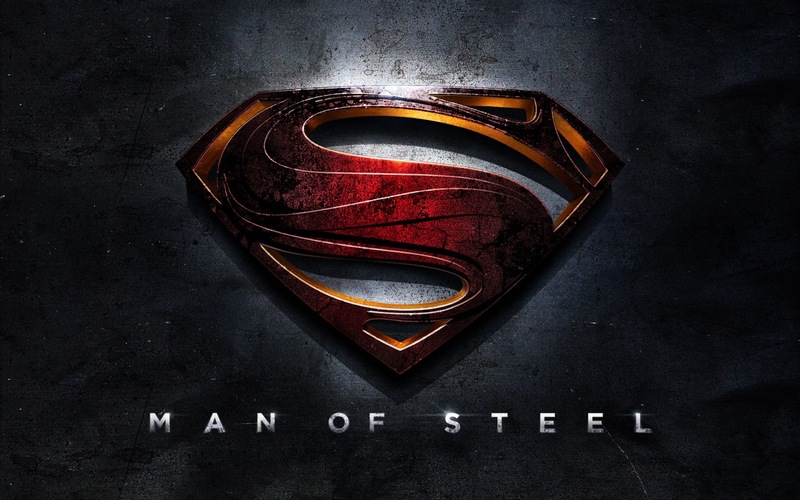 Working with a cast including Russell Crowe (Jor-El), Kevin Costner (Jonathan Kent) and Laurence Fishburne (Perry White) in key supporting roles certainly helped the endeavor along, but the task of bringing Superman to life once again on the screen ultimately fell to Henry Cavill (Clark Kent/Kal-El a/k/a Superman) and Amy Adams (Lois Lane). The movie possesses the classic Superman storyline. Kypton, the home planet of Superman's race is dying and in an effort to preserve the species, Jor-El sends his baby son off to Earth before Krypton implodes. But there is drama to this story as the spaceship containing the baby Kal-El barely escapes the attempt of General Zod (Michael Shannon) to stop its flight. The youthful Clark Kent is shown in flash backs while the main story continues. It is the classic Superman story except it does highlight the conflict that wages within Clark about wanting to use his powers for good versus his father's fear that he must remain unknown to the human race for very practical reasons. One area where this reboot differs significantly from my remembrance of the story is in the death of Jonathan Kent which is an out growth of the fear of discovery. I will admit, the movie has the obligatory fight scenes, which in my mind continue for a bit too long as they do in many movies. The plot is complex, yet direct and provides a solid basis for the movie which is much more than--look up in the sky . . . I liked the movie. It was complex and the story was compelling. The acting was solid--no oscar worthy performances, but strong performances nonetheless. RECOMMENDATION: If you saw Avengers and any of the Iron Man or Batman movies, see this movie. Although rated PG-13 (primarily for violence) it is suitable for for the more mature pre-teen crowd. I gave the movie a solid 8 out of 10. 2. 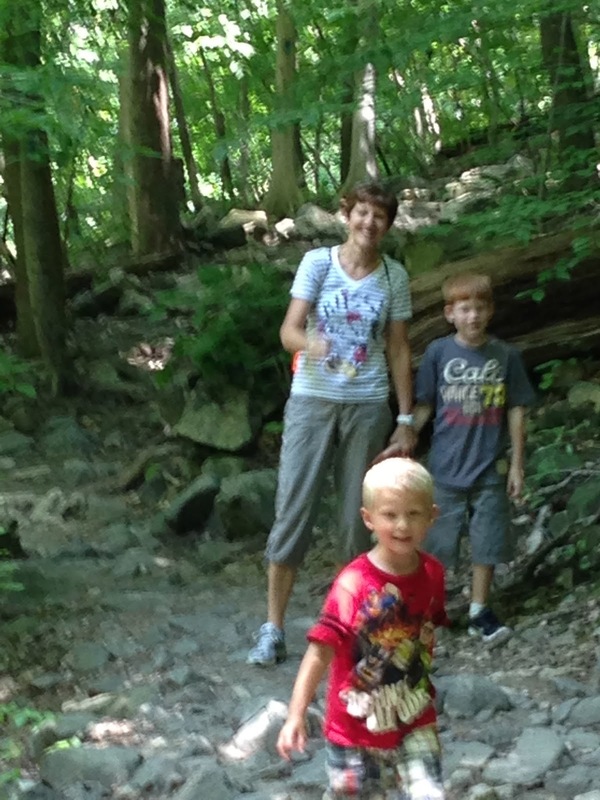 Hiking a trail in the forest on Saturday reminded me of being a kid when the forest was my playground. 3. Baseball season is nearing the half-way point. The O's have played 70 of the 162 scheduled games. 4. 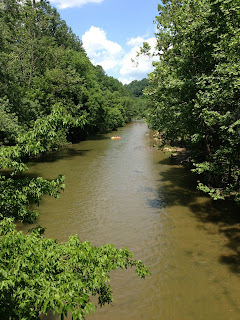 Summer vacation has arrived for the schools--I am just a little bit envious. 5. The release of the summer blockbuster movies is underway--I saw Man of Steel yesterday as part of my Father's Day present. It is a great reboot. 6. I am amazed how slowly insurance companies act when they are wasting my time and money, but how quickly things begin to move when it is their nickel. 7. The pool saw a workout this weekend. After adding some heat, it was a great place to enjoy on the almost hot weekend afternoons. An idyllic day requires unique activity. Yesterday, we did just that. 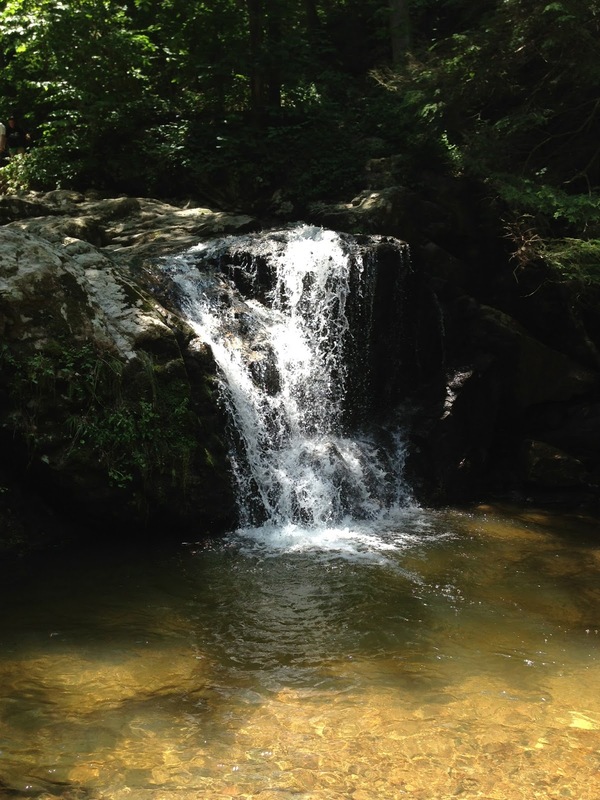 Hiking along the Patapsco River with two of the grandsons, Jax and Ethan, enjoying the low humidity and a bit too mild temperatures. It is, after all, mid-June and I would expect temperatures in the high 80's and struggling to reach 80. We hiked one of the trails to a waterfall, and amazingly kept the boys dry. 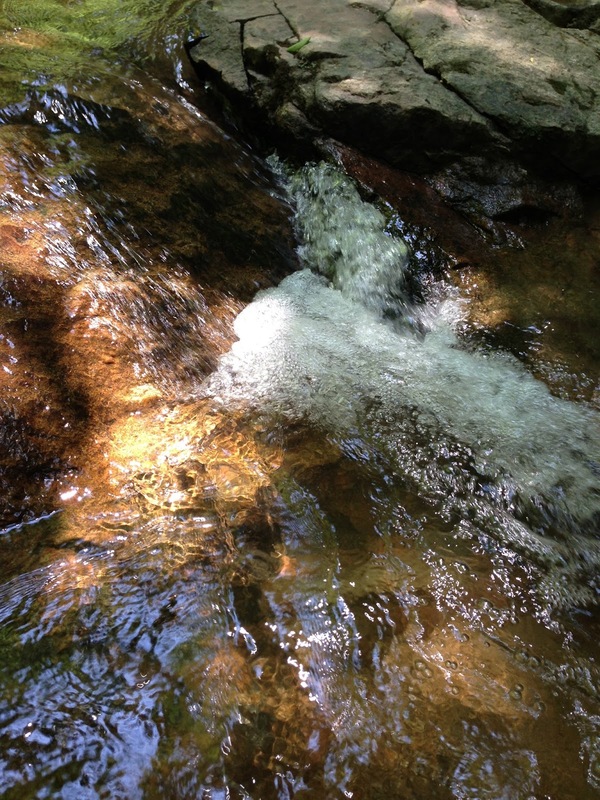 We forded various creeks along the way almost without incident. The scenery was peaceful and the exercise tired the boys. And the grandparents, too. It was, something different on a placid enjoyable Saturday afternoon. There was fun on the trails and rocks to throw into pools of water, without, of course, hitting each other. After the hike, it was off to the pool for a well deserved afternoon swim and relaxing evening. Sometimes life needs a change up. I find that on occassion I need to do something different that either pushes me out of my comfort zone or deeper into it. Last evening, it was deeper into my comfort zone. 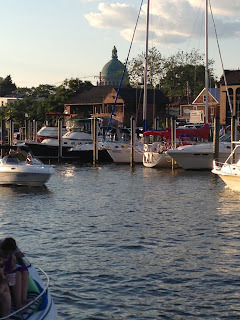 We headed off to Annapolis to enjoy the evening, the water, and the ambiance of that great city. While it is not a beach where I can put my toes in the sand, Chris and I along with a few of our friends found a table on the water to watch the comings and goings. It made for an enjoyable exclamation mark on the ending of the work week. The evening was glorious, cool--but not cold, with low and pleasant humidity. I was comfortable in my Friday attire--an aloha shirt. It seemed that everyone like us who had been held hostage to the storms of the week decided to come out to experience life on or near the water. It is evenings like last evening that sometimes cause me to think a bit too seriously about getting a boat--but in reality, I do not have time for a boat. I enjoy boats vicariously through the lives of others. Last evening, I was deriving enjoyment and moments of pleasure from the sights, the sounds, and the activity in the harbor. The sky was blue with puffy clouds. The storms were gone and the world was bathed in warm sunshine. It was, for a few hours, an enjoyable respite from the week behind and a launching pad into the weekend ahead. 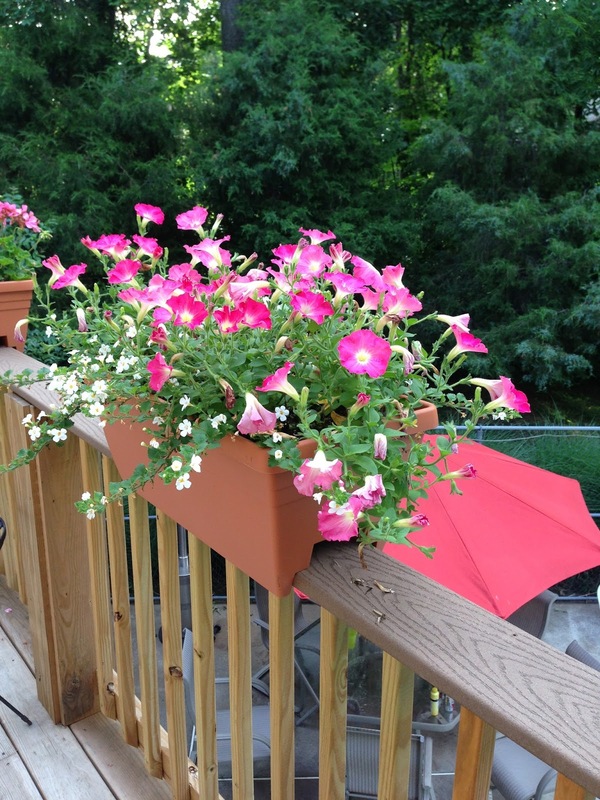 Yes, I usually enjoy sitting on my back deck--but sometimes I just need to change it up. I have been reflecting upon the accident which occurred one week ago today. Frustration at the slowness and the prospect of spending potentially thousands to replace my vehicle. I am still hung up on being the victim and the responsible party seemingly gets off. The other driver doesn't have enough insurance to cover my vehicle, clearly was at fault, and still is shirking their responsibility for the accident. I am glad that no one was seriously injured, but I hate car shopping. And spending the money. There are a lot of cars out there--but I am stile mired in the thought, why does it have to be my car that took the brunt of the accident? Sometimes life doesn't seem fair. But then, life isn't fair. Life just is. 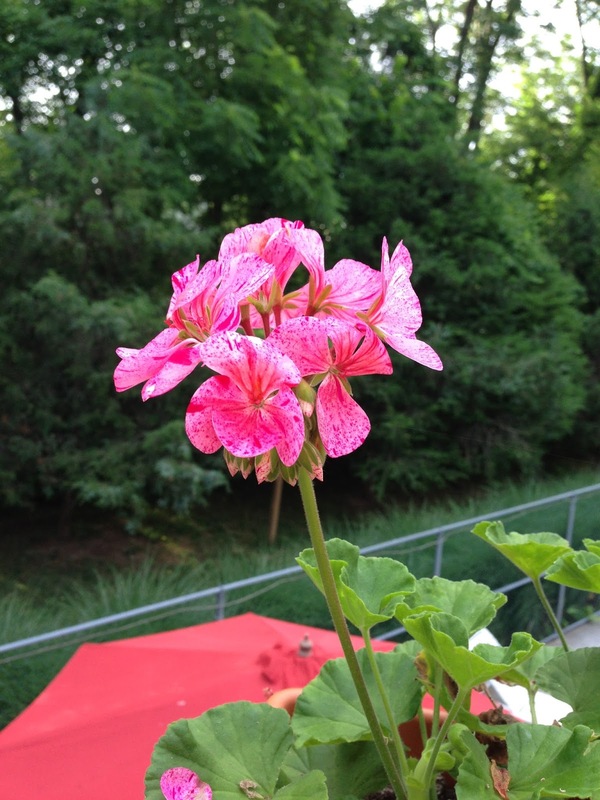 We add the value to life and try to discern fairness--but in truth, there is little fairness. That is why the other driver drove away in a seemingly unharmed vehicle and mine is still being assessed for damages. Funny Headlines--Can Bear's Really do That? While at my parents over the weekend going through old photos and newspaper clippings, I ran across a headline which had no relationship to the reason the paper was retained--but it was funny. 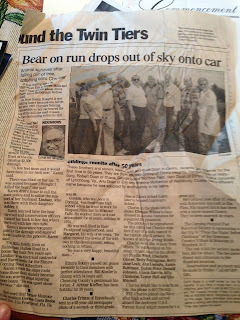 How can something like having a bear drop out of the sky onto a car happen? The photo on the page below the headline is actually of my Dad and his brothers who had gathered for a reunion after 50 years, but upon inspecting the paper--the headline stole the show. 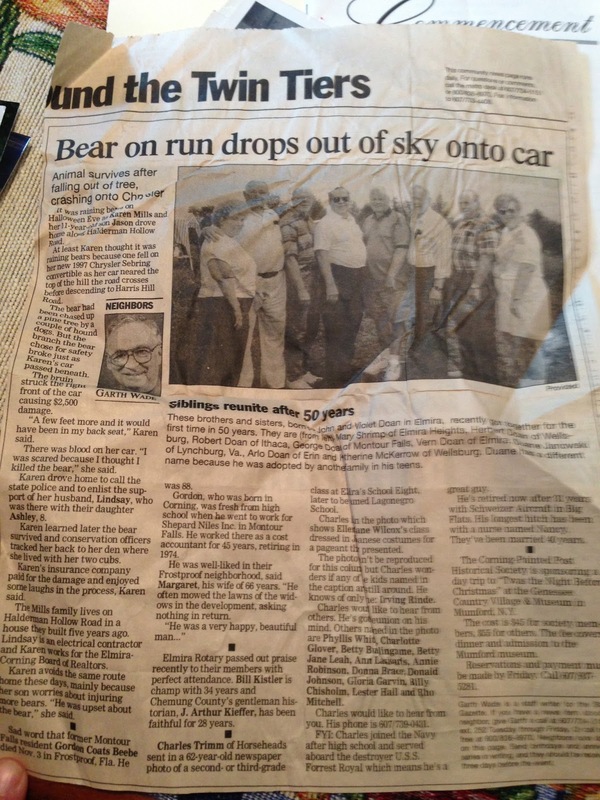 The bear fell from a tree over a road onto a convertible. What a rotten day for the driver--and the bear as well for that matter. It was a good day for my Dad and his brothers though. They had a great reunion. I've noticed other funny headlines in papers--although I have been so desensitized to them that I frequently do more than note their passing. This one, though, was special and made me launch and read the article. Sadly it had already begun, in the aftermath of the auto accident which occurred on Friday the victims are in the process of being soundly punished for being in the wrong place in time. Day two of working with the insurance companies didn't go well. While the at fault driver in the accident, according to the police report, drove away from the scene in his relatively undamaged vehicle, I cannot even seem to get my vehicle brought home to Maryland and furthermore it appears that among many other things the ridiculously low insurance standard in Pennsylvania means he doesn't even have enough insurance to cover the damages to my vehicle. I see it happening already. I will be the victim multiple times as this scenario plays out. My insurance company is taking over to make me whole--but I am already getting a lot of "no's" from them about what they will not do, like have my vehicle returned home for repairs. I do not live in Dunmore, PA. Why on earth would I want to have repairs done there? And, why should I be expected to go back to Dunmore, on my own nickel, to retrieve my vehicle when the repairs are done? Then there is the matter of whether the damages to my vehicle exceed the value and that terrible concept of totaling out the vehicle. I hate that. I cannot replace the vehicle for what I expect to receive in payment. That story is still playing out--but I have been down this road before and been low balled by the insurance company. There has to be a better way. I faithfully, and as required by law, pay my insurance premiums only to be treated like this? Lose my vehicle, not receive enough compensation to replace it, and spend enormous amounts of time negotiating with the insurance companies to be made "whole." I already know that will not happen. And the at fault driver drove off. Being a victim never ends it seems. Weddings, Funerals and Other Times, Too! I have proof that families actually can get together for functions other than weddings and funerals. Last weekend, my sisters and brother collected ourselves from across the country and descended upon my parents house to celebrate Mom's birthday. Even cooler, it was not one of those "significant" birthdays (those ending in 0's or 5's). It was a birthday and we decided to make Mom's wish come true for all four of us to be gathered in one place, with her at her house, on her birthday. Yeah, OK, I needed a little prodding from my wife--but it worked out fabulously. And it was good to see my siblings in a non-threatening setting for a couple of days. We have become a bit distant, in more than just the geographic sense. Getting together for a fun and not somber occasion--with just us, was awesome. And it made a birthday wish come true for a woman of faith and strength. 1. Visiting Mom to celebrate her birthday was a great thing to do. 2. The officer along the side of I-81 in Dunmore, PA on Friday told me that he sees accidents all of the time and as long as the people are OK, the reason we have insurance is to take care of repairing the cars to not get to worried about the damage to the vehicle. 3. Quote from my sister Pennie:"Why do I feel like I'm 10 years old when I go home?" 4. Another quote form my sister Pennie on attending Church yesterday: "When we walked into the church we attended as kids, I felt 16, then after a few introductions, I felt like I was 10, and before long, I felt like I was 5 years old sitting in the pew kicking my legs." 5. I had a weird feeling as we drove by the scene of our Friday accident on our return trip to Baltimore yesterday. Just seeing the spot and knowing what transpired there. 6. After a brief respite for a few beautiful hours yesterday, the rain has returned. 7. It is good to be home after a trip, no matter how short. 8. Did you read that the TSA in Denver stopped Chewbacca? I've had trouble getting through Denver security and now I know why. It is weird getting up in the morning and looking out the window of the house seeing a foreign vehicle in the driveway, this one with Kentucky plates on it, and realize it is the one that I am expected to drive. 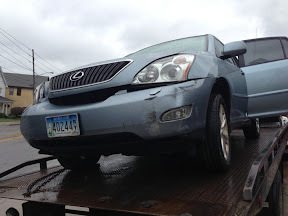 It is the aftermath of the accident which has resulted in the Lexus being stored at a salvage yard until the adjusters show up to determine its fate. With the Lexus gone, there is a temporary replacement in my "stable." I don't particularly like it, but it is functional and temporary. Chris and I are in that I between mode. Will the Lexus be total loss? Will we receive a worthy settlement? What type of vehicle can ever possibly replace such a versatile and well built vehicle? So many questions. I've been looking at the brightly colored Jeeps on the road, but even the venerable and solidly built Jeeps are not a worthy Lexus SUV replacement. Still, there may be a two-for-one trade in the future. Time will tell. Until then, there is a strange vehicle in my driveway, and it is the one I'm driving. What a day Friday was. That is a bit of an understatement because after picking one of my sisters up from the airport in Baltimore, we headed off to upstate NY to celebrate Mom's birthday. The day was rainy as Tropical Storm Andrea made her presence known. The roads were wet and traffic was moving, but most drivers were wary of the ever changing road conditions. About three and a half hours into the trip, Chris was driving on a wet road north of Scranton, PA on interstate 81 in the town of Dunmore, everything changed and a near catastrophe became an example of heroes among us in many places. A red Grand Cherokee probably lost traction and hydroplaned into the passenger rear door of our Lexus which made, after two separate impacts, both vehicles swing around 180 degrees in the road and across two lanes of traffic to come to rest along the barrier on the other side of the road. The third impact was with the barrier and wrecked the front of the Lexus. After determining that everyone was generally unharmed, except for some glass cut due to the window in the damaged passenger door disintegrating and sore shoulders due to seat belts, our trip was in momentary chaos. Then the heroes arrived on the scene in the form of the Pennsylvania state police, the Dunmore fire department, and De Naples auto parts and tow truck. As we were overcoming the shock of the accident, these professionals took care of our needs and even transported us to the fire station and the car rental agency to help us clean up and recover and allow our trip to continue. The accident could have been horrible, with two vehicles doing a 180 degree slide and crossing two lanes of a rush hour busy interstate, but it wasn't. 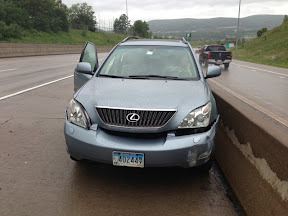 I was the first to the damage to the Lexus, which is severe. Chris and my sisters, Pennie and Kay, were trapped in the car until the fire department arrived and assessed the scene. The driver side of the vehicle came to rest with the back tire on the retaining wall, but sustaining no damage. After checking it the vehicle they asked Chris if she could start the car and pull it forward, which amazingly enough she was able to do. At that point as they got out and the ambulance arrived, they could see the extensive damage compared to the minor ding on the Jeep. But, I have to write, even though the passenger door is clearly crushed, except for the broken glass the damage is not obvious from the interior. Great design! The care and comfort we received from the heroes of Dunmore was awesome. They were instrumental in making a serious accident less traumatic. They were thoughtful and caring to the point of helping us empty our loved Lexus of all of our personal belongings back at the Hose Company in case the last time we see our SUV is when it was driving away on the back of the tow vehicle. Although the damage doesn't seem so catastrophic, we have been assured that the vehicle will likely be totaled. Sadly. Our families were awesome in the adversity as well. Everyone offered to come help--some from even 14 hours driving time away. The concern from all of them was genuine and appreciated. And so, after a two hour delay in our day, we were on the road again in a rental provided by my insurance company, but with fond memories of Dunmore, PA, and the professionals that represent the town. Here Comes the Rain, Again! Tropical storms, rain, wind, mess, and chilly. That is the forecast. Ugh! When will the heat begin? But, as I was walking out of the club after racquetball this morning I noticed the smell of the rain and the cleansed earth in the air. So, even though it is raining, and I love rain, there are some positives--providing that the rain eventually gives way to summer. But the rain is overwatering the plants in the pots outside--much like frosts at the beginning or ending of the season, the potted plants need to come in out of the rain! So much rain and so little time. At least everything is green right now and fully prepared for the summer. And, I have heard that we have been spared the plague of the cicadas. So with the rain giving way to the need to mow the lawn and the continued greening of the landscape, it is not all bad--just depressing. The gray skies get me a bit down though. But, hey, the weekend is almost here! There is a bright thought. I am amazed how often I receive chain email and other notices that contain bad and untrue information. We need to be more careful about what we forward and be careful to check sources before sending bad information along. Sending along erroneous information without checking it out wastes a lot of time. And can have bad consequences. It also makes anything sent by the sender, suspect factually. The latest on I received was about the Facebook Graph App. Sadly, although the hoax sounds authentic, the facts are materially different from reality--and reality is well documented. It is a hoax. The really funny part about this hoax is that it makes the reader believe that it is possible to post data on the internet and keep it private. The most important rule of the internet--anything you post will eventually be read by anyone and everyone who wants to read it. If you think there is any privacy, you are woefully uninformed. If you want privacy--unplug your computer. Watch the hoaxes, minimize the bad info--and realize, privacy is a facade on the internet and we'll all be happier. Over the past 70 or so years, the military has been used as a social engineering prototype for society. Look at the success of the integration of the races within the military--from segregated units at the beginning of WW2 to shortly thereafter fully integrated units. There is a case to be made that the great baseball player, number 42, Jackie Robinson or the Syracuse running back Ernie Davis could never have been successful in crossing the color barrier without the social engineering which preceded them in the military. I have been reading about the recent spate of sexual misconduct problems in the military, and frankly, I am mystified. Women and men have been working together in the military for decades. I know, I have personal experience working for and with women. I can categorically state that it works. Just like the integration of races, the integration of genders is a military decades long pioneered success story. So what is different now that all of these incidents are being reported? In my mind it is leadership. Or the lack of leadership from the lowest to the highest levels. We live in a risk averse society and the military is beginning to adopt a risk averse mentality. This is a recipe for failure. The military, by design, is a high risk environment. Where else is the reward for doing you duty faithfully possibly death? The current crop of military leadership has grown up in an environment of microscopic oversight which leads to legal entanglements and a stifling of initiative which results in management rather than leadership. And it results in rules and laws replacing the demand for common sense and good judgement. The loss of judgement by leaders is what is behind the problems currently being experienced by our military. We need, our military needs a new crop of leaders who can make decisions without having to consult lawyers before making a decision. On Sunday, Ethan's lacrosse team participated in a season ending tournament. His team played three shortened games during a five hour span. The temperatures were in the low 90's, the sky was clear and blue, and the sun was hot. It was truly the beginning of summer. The week before Ethan and the rest of our family had been at the beach where the temperatures barely climbed into the 60's and the sun's warmth was only making beach time just bearable. Lacrosse is a great sport--as are most sports. The game teaches teamwork, position play, rules, and most of all it helps develop work ethic. Work hard to develop skills and success will follow. While winning is important--it is not the most important part of the game. Sportsmanship is key. This week, "E" wore orange socks to help us find him on the field of play. Sometimes during the long season it was difficult to determine where he was on the field and the numbers, although clear in the image, are not so clear in real time. Orange socks really helped. On the field of play, Ethan made more than a few good stick checks while playing defense and he avoided being penalized for the usual stuff, pushing and slashing. But, it was hot! Really hot. Almost stifling hot. It was awesome just a week after suffering in the cold on the beach we were sweltering in the heat on the playing field. 1. Unbelievably, it is June already. 2. My worst day of the week is Thursday and I was just told by someone that for the next two weeks, every day is Thursday. 3. Yesterday the temperature dropped 21 degrees in about an hour as the thunderstorms arrived. 4. Sunday afternoon, in the pool, listening to the Orioles comeback win over the Tigers--what could be better? 5. Lawns mowed, gardens weeded, projects done for the week and now it is time to start all over again. 6. 90 plus degree days really make summertime a reality. 7. Some of my family just returned from a cruise. It sounds like a lot of fun. I believe there may be a cruise in my future. Honeysuckle on wafting on the breeze as the temperatures hit 94 on the baseball diamond yesterday really brought home how great it felt to be on a floatie in the pool during the late afternoon. It took until June for me to finally get in the pool, but as I was baking in the sun I realized that this is what I dream of doing every afternoon that I am not at the beach. While I was basking in the sun, I realized that despite all of the warnings about sun exposure leading to skin cancer that I am a sun worshipper of sorts. It felt great to be warm in the sun. The trees and ornamental grasses around the pool have created a private haven carved out from the middle of suburbia. Everyone needs a refuge from the hectic pace of life. My pool is mine. I have been considering the impact of email versus the personal interaction in a technology enabled world leadership environment. I still remember those times not so long ago when typing a letter or a note was a major production, yet now notes in the form of email are sent almost without thinking. And that can be a problem. Leading organizations and teams requires adapting to the workers and the work environment. It is too easy for leaders to lose the personal touch and by default become managers rather than leaders. Leading through email ins not always the best option. There are environments where that is the best option--like leading software writers and computer forensics personnel who are inherently introverts and are all about the technology and not human contact. I suppose if I walked up to them and started a conversation they would be terrified and upset about being distracted for solving the deepest secrets of the project they are engaged in. But, there remain those work environments which require human touch. Where management by email is definitely the wrong approach. Some people need the personal touch. What I have noticed is that email questions receive email answers and that often is the incomplete message. Having a face to face discussion and getting the full sense of both the question and the answer is far more efficient than a series of emails each providing a chained iteration and expansion on the previous but never really answering the question. Additionally, some items should never be placed into email--especially private and personnel related matters. Email never goes away. Once written, the writer should expect that the email will always be out there somewhere. Leading in a technology enabled world requires being able to distinguish between when hiding behind the technology is the right approach and when the personal touch is required. Especially in an analytic environment--the personal touch is best. People who collaborate regularly seem to respond better to engaged and personal leadership. Leaders must know their people to determine the best style and approach.